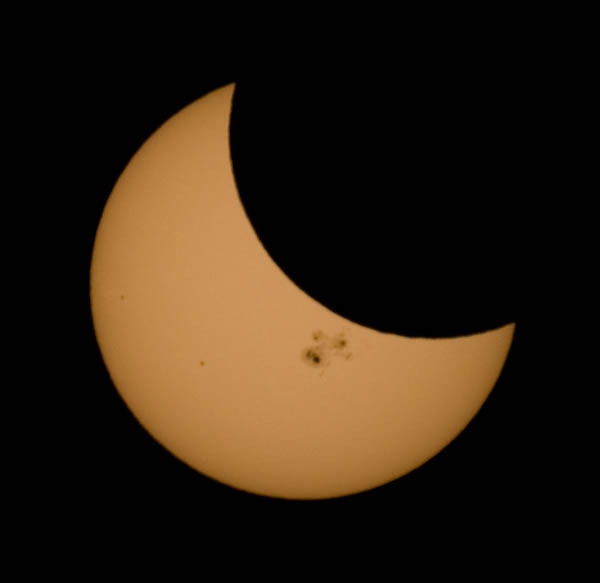 On October 23, 2014, there was a partial solar eclipse visible from the Seattle area (and numerous other locations). The weather forecast was fairly discouraging, including for areas over the mountains and further south. So, we decided to just hang out around home and hope for the best. The sky cleared and we got a nice view of the sun about an hour or so before the eclipse started. Cathy checked out the sun through a filter and noticed that there was an extensive sunspot which made for interesting viewing. So, we headed to a nearby location where trees wouldn't be obscuring our view of the sky and set up telescope and camera with appropriate solar filters. We also had a handful of hand-held filters that we shared with friends and family who were braving the cold and threat of rain with us. 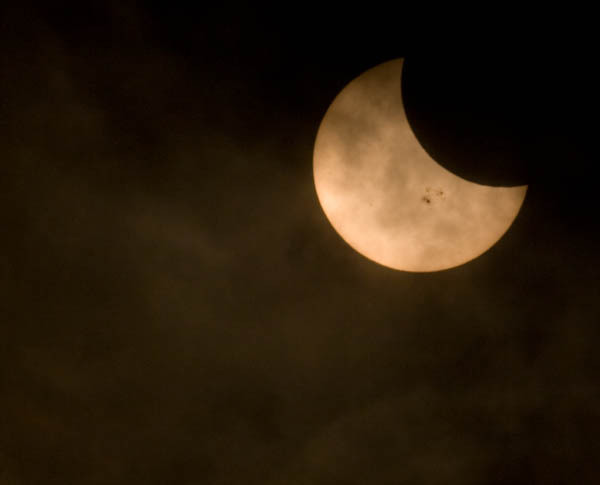 For the first part of the eclipse, the clouds were thick enough that the sun was obscured. We would catch very occasional glimpses of it, barely visible through the clouds and usually not bright enough to be visible through the filters, so we couldn't aim the telescope and camera. 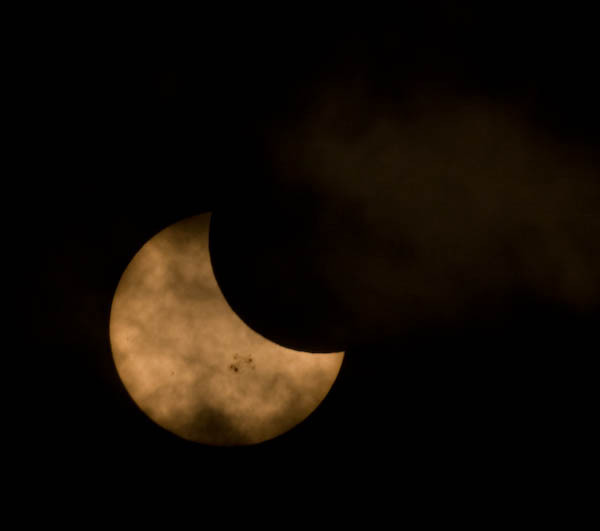 Partial solar eclipse behind the clouds. Thinning clouds, glowing helpfully to assist with aiming the camera. ...and after a short while, the clouds moved away from the sun (briefly) and we got some unobstructed views of the eclipse and sunspots. Clear view of the eclipse and sunspots. Shortly after this, the clouds returned and our fun was over. We were able to watch until about 15 minutes before the maximum eclipse, though, and managed to get our equipment packed up before it started raining, so overall it was a very successful adventure!